I wasn’t expecting to crochet any hats (toques) today but this one snuck in to my afternoon. We started Veteran’s Day (Remembrance Day here in Canada) by visiting Michael’s Crafts Store as it was having a two-day sale. I found a 20% off coupon in the local flyer so I couldn’t pass it up. I loaded up on yarn for future projects and then we decided to have dim sum before heading home. Not wanting to take an MSG-induced nap, I decided to put this green and blue variegated yarn to use. I had planned to crochet hats for local charity donation after I finish my scarf project. However, the temptation of the hat project got the better of me today. I bookmarked this free ribbed hat crochet pattern a few days ago and decided to try it this afternoon. Wow, did it come together quickly! 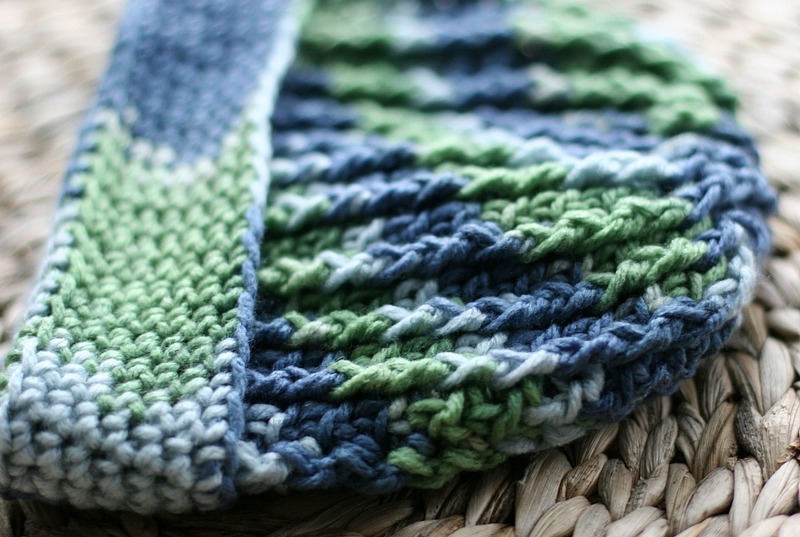 The front-post double chain is one of my favorite stitches and I love that it’s the star in this pattern. By alternating front-post double chains with regular double chains you achieve the ribbed texture in this hat. I made the hat as suggested in the pattern (size K hook, worsted weight yarn) but I found the hat a bit too tight for a normal adult head. 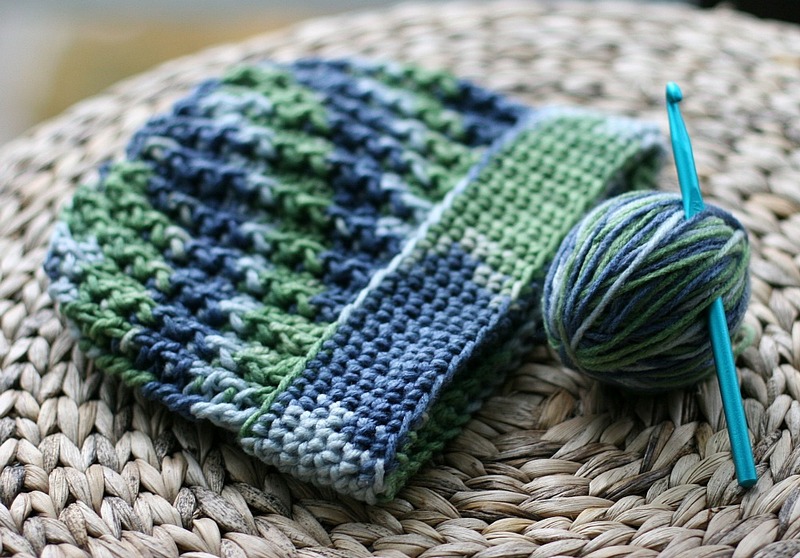 Sizing will vary by the type of yarn, hook, and tension used in the crochet. For me, I will increase the stitches next time to achieve a slightly larger size. 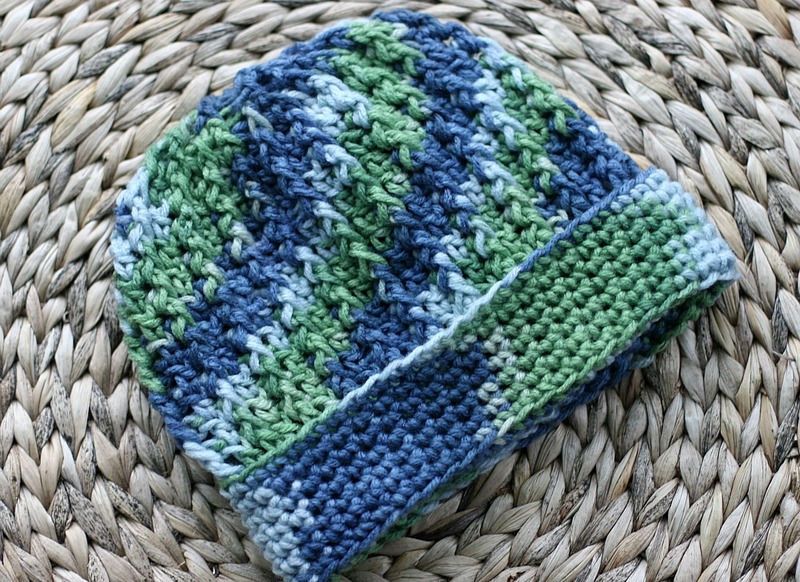 However, the hat is the perfect size for a child or young adult. It’s only mid-afternoon so I’m thinking there’s time to make one more hat before dinner (assuming I’m not distracted now by blogging). Fortunately, no one is complaining about hunger as we did have a big late breakfast/early lunch. Back to crocheting for me but I hope everyone is enjoying this public day of recognition for the armed forces, regardless of how you are spending the time. I would like to offer a big thank you to all of the men and women in the military units from both Canada and the United States who faithfully serve to protect our freedoms. Although a thank-you is not nearly enough for the work you’ve done and continue to do, I hope you know how much it means to me! Hello, I am looking at your great hat and think it is one of the nicest crocheted hats I have ever seen. Usually I only crochet blankets, baby sweaters and booties and knit everything else. Because I just don’t like the look of crocheted hats. But you have totally changed my mind, this is a great pattern. Thank you for your kind words, Linda! I’ve been a little hat crazy this week and have made four so far. I ended up starting with a chain of 54 to make this hat fit my head comfortably. I love the look of knitted work and need to practice with it more. I’ve only made one knitted scarf so far and really need to try making a hat. Love the hat looks fantastic. Would be great for my boys.